Both the static and portable compactors that we provide at Phoenix will help you manage your waste in a cost-efficient and environmentally-friendly way. No matter whether you require a portable compactor for rental or a static compactor to buy, we will ensure that you receive a customer-centred service to suit you. We not only install the compactors on-site for you, we also provide ongoing customer support via radio contact, so that our experts are always on hand to help you however you may require. 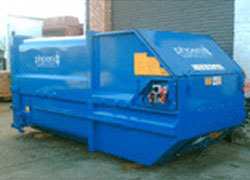 Phoenix can offer you either static or portable compactors depending on your specific waste disposal needs. We are particularly adept at assessing your waste situation and providing a system which is designed to suit your bespoke requirements. Below shows our static and portable compactors. The main difference between our equipment is that static compactors are bolted to the ground and dispose waste into the adjacent compaction container, whereas portable compactors are independent units which the waste disposal contractor can take away, empty and return. Static compactors are bigger and can compact more waste as in an industrial setting, while portables are beneficial where space is at a premium. 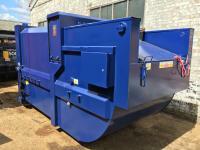 Whether you want to buy or rent, we are here to discuss which type of compactor will suit you best.